A breathtaking wedding and event venue located in the heart of the Loess Hills. Wishing Hills Barn is temperature controlled newly constructed barn located just a short 30 miles North of the Omaha/Council Bluffs area. 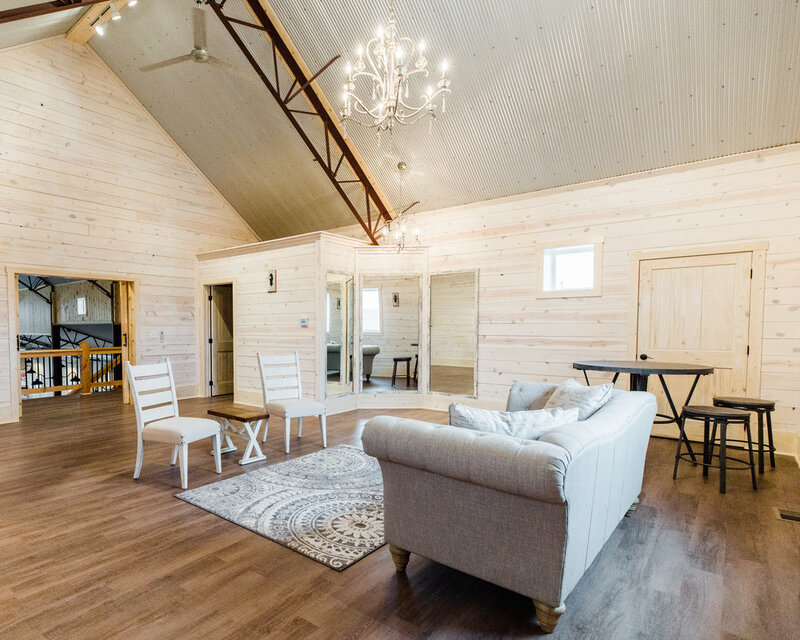 300 guests can fit comfortably within the barn's walls or in our outdoor ceremony area, This venue is exactly what you are looking for; offering a bridal loft, grooms suite, outdoor covered reception area and prep kitchen. This country setting wedding and event venue will blow you away with our stunning facility, prime location on paved road, and midwest charm. *If set up requires tables and decorating to be done by Wishing Hills Staff between ceremony & reception. No additional indoor ceremony charge if guests are seated at reception tables during ceremony. Can I use my own caterer? You are welcome to use any licensed and insured caterer. We do ask that your caterer be in touch with Wishing Hills Barn prior to the event to make specific arrangements. Can we bring in our own alcohol? Our liquor license does not allow outside alcohol. If there are specific items that you are interested in that are not included in the package details please just ask. No one under 21 will be allowed to consume alcohol on Wishing Hills Barn premises. A security guard will be provided for events with 50 or more guests and alcohol is being served. Can we decorate any way we prefer? We ask that all decorations be discussed and preapproved. We do not allow any nailing or attaching things to the wall or ceiling unless it is specifically preapproved. We also do not allow open flame candles. You may arrange the tables any way you choose. Please remember that anything you bring in must be removed by the end of your event. What is the maximum occupancy? Wishing Hills Barn will seat up to 300 guests at round tables. We can seat up to 300 guests at the outside wedding venue as well. An indoor wedding venue can be set up as you prefer with tables and chairs or simply up to 300 chairs. Please note if you prefer an indoor ceremony with chairs only you will need to allow time to set up tables and decorate prior the reception. When do we pay for our event? We require a 50% non-refundable down payment at the time of booking and signing of contract. The remainder of the rental payment and the 15% service fee is due 60 days prior to the event. A total guest count and 50% of the beverage package cost is required 30 days prior to your event. The remaining beverage package payment and 15% service fee is due the day of the event. What does the 15% service fee cover? The service fee includes but is not limited to our planning meetings with you, any communication with your vendors, sales tax and the overall execution of your event. When can I set up for my event? You will have access to the facility beginning at 8 a.m. the day of your event. In the event we are not booked the evening before we may make arrangements for set up and decorating at an earlier time. We will ensure tables are set up based upon your desired floor plan prior to your arrival. How do I arrange for scheduling of deliveries and DJ/Photographer set up? Please communicate your needs with Wishing Hills Barn and we will ensure your day runs smoothly. You may use any DJ or Photographer of your choice. We also provide a cooler to assist you with flowers, desserts, etc.